If you haven't figured it out yet, I am incredibly passionate about community college success. The data out there about community colleges only serves to fuel that passion, because it highlights community college access and the need for increased educational equality and economic opportunity in our country. So here are the facts – all of these come from either the American Association of Community Colleges or the United States Census Bureau. The percentages of adults in the US holding Bachelor’s degrees breaks down as: 34% of non-Hispanic whites, 20% of blacks, 14% of Hispanics. I think all three of those numbers are representative of the need for an increased educational opportunity in our country. The average wage for those with high school diploma only in 2010 was $31,000 per year. The average holder of an associate degree increases their annual earnings by almost $8,000 per year over those with only high school diplomas. And those with a Bachelor’s degree earn an average salary of $58,000 per year. Those income gaps make a compelling case for higher education. More than 12.4 million students attend community college each year; one of the main reasons for this is that community college enrollment increases the number of students accessing higher education in the United States by 56%. Community colleges are often overlooked - and yet they can't afford to be anymore because of the massive opportunity and access granted by these institutions. Forty-two percent of first-generation college students, the first in family to attend or graduate college (like myself), attend community college. Community colleges actively help people break through glass ceilings and break cycles of poverty. More than 40% of undergraduate students who live in poverty attend community college. Again, community colleges open access to opportunity. Because each year, community colleges award 932,000 degrees or certificates, granting almost one million people license to enter economic doors that were previously closed. Ultimately, I care about these facts because I truly care about the people that they represent. I was (and will always be) a part of those statistics. 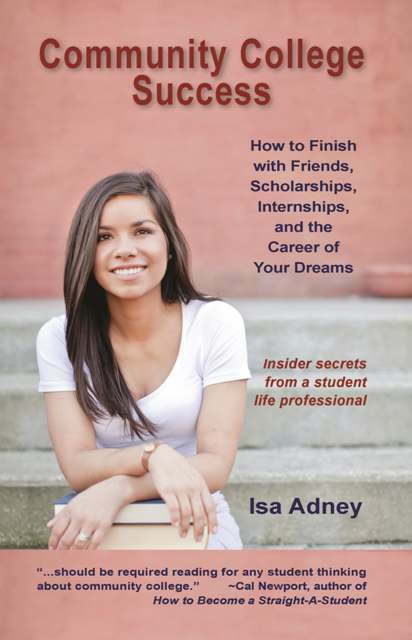 People and the relationships we build determine so much of the world that we live in – the advice I offer in my book was written solely because I think that everyone deserves a chance to pursue their dreams, regardless of where they start their college experience. Because as so many before me have said, it isn’t where you start, it is where you finish. And to get to the places where you want to finish, you have to cultivate relationships with those around you while building yourself academically and professionally. 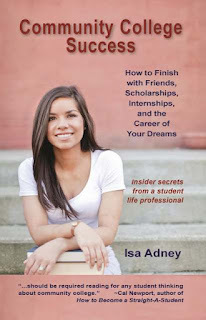 I hope you get a chance to read my book – I truly offered every bit of advice I could to help guide students to success. I look forward to hearing what you think on our Facebook page, and appreciate your support more than you know. Dining out with your professors? Come chat with me tonight!? Learning about the job market from the mall? Yep.